Category Pork and tagged Paleo stuffed mushrooms, stuffed mushrooms. Kids are headed back to school tomorrow after the break and life will get back to a somewhat normal routine. Things in our house are a little unorganized at the moment, and probably will be until we move in a few weeks. I had my parents over for dinner last night because my mom headed to Africa today. She's going to Africa for 10 days to observe gorillas in the wild!! What can I say, my mom is always up for an adventure, and loves to travel. Anyway, so my parents came over and I served these mushrooms to them before our meal. My dad said they were the best things he had ever eaten. 2. Now remove the stems of the mushrooms and scoop out the center for better stuffing. 3. Place mushroom caps on a baking sheet and lightly drizzle with olive oil. 4. Now bake for 10 minutes, flip them and bake on the other side for 5 minutes. 5. In a skillet start to brown the mushroom stems ,onion, garlic, and sausage in olive oil.Season with salt and pepper and garlic powder. 6. Reduce heat and add fresh spinach. Once spinach cooks down a little turn heat off. 8. Stuff each mushroom with meat mixture and any left over mixture place in a small ramekin. 9. Place on baking sheet and bake for 10 minutes. 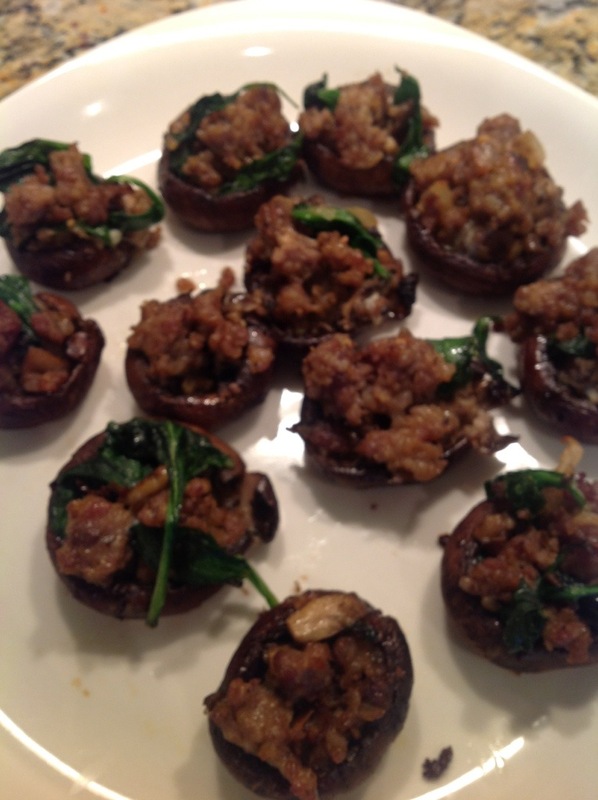 This entry was posted in Pork and tagged Paleo stuffed mushrooms, stuffed mushrooms. Bookmark the permalink. I saved this recipe in my files, I like this and we know Greg has good taste so that was a great testimony . What is the calorie/carb count for these, if you happen to know?